This chapter outlines the crop coefficient approach for calculating the crop evapotranspiration under standard conditions (ETc). The standard conditions refer to crops grown in large fields under excellent agronomic and soil water conditions. The crop evapotranspiration differs distinctly from the reference evapotranspiration (ETo) as the ground cover, canopy properties and aerodynamic resistance of the crop are different from grass. The effects of characteristics that distinguish field crops from grass are integrated into the crop coefficient (Kc). In the crop coefficient approach, crop evapotranspiration is calculated by multiplying ETo by Kc. Differences in evaporation and transpiration between field crops and the reference grass surface can be integrated in a single crop coefficient (Kc) or separated into two coefficients: a basal crop (Kcb) and a soil evaporation coefficient (Ke), i.e., Kc = Kcb + Ke. The approach to follow should be selected as a function of the purpose of the calculation, the accuracy required and the data available. The evapotranspiration rate from a cropped surface can be directly measured by the mass transfer or the energy balance method. It can also be derived from studies of the soil water balance determined from cropped fields or from lysimeters. Crop evapotranspiration can also be derived from meteorological and crop data by means of the Penman-Monteith equation (Eq. 3). By adjusting the albedo and the aerodynamic and canopy surface resistances to the growing characteristics of the specific crop, the evapotranspiration rate can be directly estimated. The albedo and resistances are, however, difficult to estimate accurately as they may vary continually during the growing season as climatic conditions change, as the crop develops, and with wetness of the soil surface. The canopy resistance will further be influenced by the soil water availability, and it increases strongly if the crop is subjected to water stress. As there is still a considerable lack of consolidated information on the aerodynamic and canopy resistances for the various cropped surfaces, the FAO Penman-Monteith method is used in this handbook only for estimating ETo, the evapotranspiration from a well-watered hypothetical grass surface having fixed crop height, albedo and surface resistance. ETo reference crop evapotranspiration [mm d-1]. Most of the effects of the various weather conditions are incorporated into the ETo estimate. Therefore, as ETo represents an index of climatic demand, Kc varies predominately with the specific crop characteristics and only to a limited extent with climate. This enables the transfer of standard values for Kc between locations and between climates. This has been a primary reason for the global acceptance and usefulness of the crop coefficient approach and the Kc factors developed in past studies. · Crop height. The crop height influences the aerodynamic resistance term, ra, of the FAO Penman-Monteith equation and the turbulent transfer of vapour from the crop into the atmosphere. The ra tenu appears twice in me full form of the FAO Penman-Monteith equation. · Albedo (reflectance) of the crop-soil surface. The albedo is affected by the fraction of ground covered by vegetation and by the soil surface wetness. The albedo of the crop-soil surface influences the net radiation of the surface, Rn, which is the primary source of the energy exchange for the evaporation process. · Canopy resistance. The resistance of me crop to vapour transfer is affected by leaf area (number of stomata), leaf age and condition, and the degree of stomatal control. The canopy resistance influences the surface resistance, rs. · Evaporation from soil, especially exposed soil. The soil surface wetness and the fraction of ground covered by vegetation influence the surface resistance, rs. Following soil wetting, the vapour transfer rate from the soil is high, especially for crops having incomplete ground cover. The combined surface resistance of the canopy and of the soil determines the (bulk) surface resistance, rs. The surface resistance term in the Penman-Monteith equation represents the resistance to vapour flow from within plant leaves and from beneath the soil surface. The Kc in Equation 56 predicts ETc under standard conditions. This represents the upper envelope of crop evapotranspiration and represents conditions where no limitations are placed on crop growth or evapotranspiration due to water shortage, crop density, or disease, weed, insect or salinity pressures. The ETc predicted by Kc is adjusted if necessary to non-standard conditions, ETc adj, where any environmental condition or characteristic is known to have an impact on or to limit ETc. Factors for correcting ETc to ETc adj are described in Part C.
The crop coefficient integrates the effect of characteristics that distinguish a typical field crop from the grass reference, which has a constant appearance and a complete ground cover. Consequently, different crops will have different Kc coefficients. The changing characteristics of the crop over the growing season also affect the Kc coefficient. Finally, as evaporation is an integrated part of crop evapotranspiration, conditions affecting soil evaporation will also have an effect on Kc. Due to differences in albedo, crop height, aerodynamic properties, and leaf and stomata properties, the evapotranspiration from full grown, well-watered crops differs from ETo. 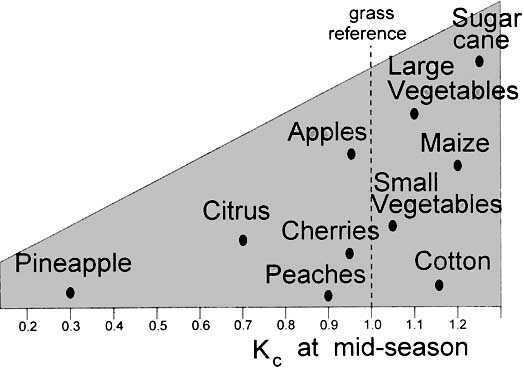 The close spacings of plants and taller canopy height and roughness of many full grown agricultural crops cause these crops to have Kc factors that are larger than 1. The Kc factor is often 5-10% higher than the reference (where Kc = 1.0), and even 15-20% greater for some tall crops such as maize, sorghum or sugar cane (Figure 20). Typical values for the crop coefficient for full grown crops (Kc mid) are listed in Table 12. Crops such as pineapples, that close their stomata during the day, have very small crop coefficients. In most species, however, the stomata open as irradiance increases. In addition to the stomatal response to environment, the position and number of the stomata and the resistance of the cuticula to vapour transfer determine the water loss from the crop. Species with stomata on only the lower side of the leaf and/or large leaf resistances will have relatively smaller Kc values. This is the case for citrus and most deciduous fruit trees. 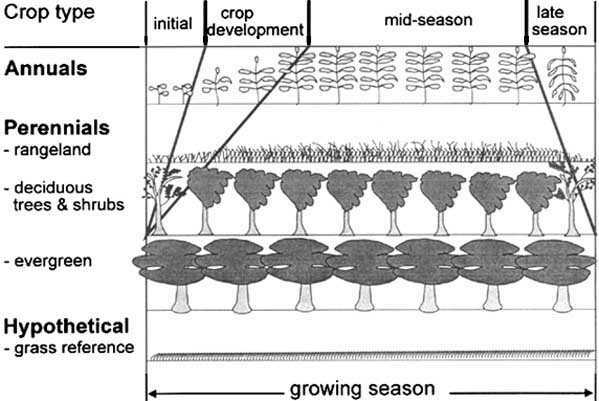 Transpiration control and spacing of the trees, providing only 70% ground cover for mature trees, may cause the Kc of those trees, if cultivated without a ground cover crop, to be smaller than one (Figure 20). The Kc values of Table 12 are typical values expected for average Kc under a standard climatic condition, which is defined as a sub-humid climate with average daytime minimum relative humidity (RHmin) » 45% and having calm to moderate wind speeds averaging 2 m/s. Variations in wind alter the aerodynamic resistance of the crops and hence their crop coefficients, especially for those crops that are substantially taller than the hypothetical grass reference. The effect of the difference in aerodynamic properties between the grass reference surface and agricultural crops is not only crop specific. It also varies with the climatic conditions and crop height. Because aerodynamic properties are greater for many agricultural crops as compared to the grass reference, the ratio of ETc to ETo (i.e., Kc) for many crops increases as wind speed increases and as relative humidity decreases. More arid climates and conditions of greater wind speed will have higher values for Kc. More humid climates and conditions of lower wind speed will have lower values for Kc. 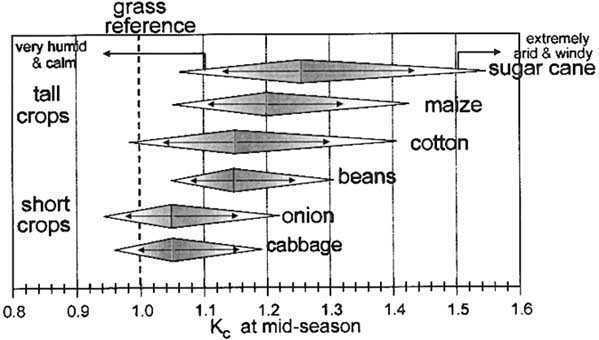 The relative impact of the climate on Kc for full grown crops is illustrated in Figure 21. The upper bounds represent extremely arid and windy conditions, while the lower bounds are valid under very humid and calm weather conditions. The ranges expected in Kc as climate and weather conditions change are quite small for short crops but are large for tall crops. Guidelines for the adjustment of Kc to the climatic conditions as a function of crop height are given in Chapter 6. Under humid and calm wind conditions, Kc becomes less dependent on the differences between the aerodynamic components of ETc and ETo and the Kc values for 'full-cover' agricultural crops do not exceed 1.0 by more than about 0.05. This is because full-cover agricultural crops and the reference crop of clipped grass both provide for nearly maximum absorption of shortwave radiation, which is the primary energy source for evaporation under humid and calm conditions. Generally, the albedos, a, are similar over a wide range of full-cover agricultural crops, including the reference crop. Because the vapour pressure deficit (es - ea) is small under humid conditions, differences in ET caused by differences in aerodynamic resistance, ra, between the agricultural crop and the reference crop are also small, especially with low to moderate wind speed. Under arid conditions, the effect of differences in ra between the agricultural crop and the grass reference crop on ETc become more pronounced because the (es - ea) term may be relatively large. The larger magnitudes of (es - ea) amplify differences in the aerodynamic term in the numerator of the Penman-Monteith equation (Equation 3) for both the crop and the reference crop. Hence, Kc will be larger under arid conditions when the agricultural crop has a leaf area and roughness height that are greater than that of the grass reference. Because the 1/ra term in the numerator of the Penman-Monteith equation (Equation 3) is multiplied by the vapour pressure deficit (es - ea), the ET from tall crops increases proportionately more relative to ETo than does ET from short crops when relative humidity is low. The Kc for tall crops, such as those 2-3 m in height, can be as much as 30% higher in a windy, arid climate as compared with a calm, humid climate. The increase in Kc is due to the influence of the larger aerodynamic roughness of the tall crop relative to grass on the transport of water vapour from the surface. Differences in soil evaporation and crop transpiration between field crops and the reference surface are integrated within the crop coefficient. The Kc coefficient for full-cover crops primarily reflects differences in transpiration as the contribution of soil evaporation is relatively small. After rainfall or irrigation, the effect of evaporation is predominant when the crop is small and scarcely shades the ground. For such low-cover conditions, the Kc coefficient is determined largely by the frequency with which the soil surface is wetted. Where the soil is wet for most of the time from irrigation or rain, the evaporation from the soil surface will be considerable and Kc may exceed 1. On the other hand, where the soil surface is dry, evaporation is restricted and Kc will be small and might even drop to as low as 0.1 (Figure 22). Differences in soil evaporation between the field crop and the reference surface can be forecast more precisely by using a dual crop coefficient. As the crop develops, the ground cover, crop height and the leaf area change. Due to differences in evapotranspiration during the various growth stages, the Kc for a given crop will vary over the growing period. The growing period can be divided into four distinct growth stages: initial, crop development, mid-season and late season. Figure 23 illustrates the general sequence and proportion of these stages for different types of crops. The initial stage runs from planting date to approximately 10% ground cover. The length of the initial period is highly dependent on the crop, the crop variety, the planting date and the climate. The end of the initial period is determined as the time when approximately 10% of the ground surface is covered by green vegetation. For perennial crops, the planting date is replaced by the 'greenup' date, i.e., the time when the initiation of new leaves occurs. During the initial period, the leaf area is small, and evapotranspiration is predominately in the form of soil evaporation. Therefore, the Kc during the initial period (Kc ini) is large when the soil is wet from irrigation and rainfall and is low when the soil surface is dry. 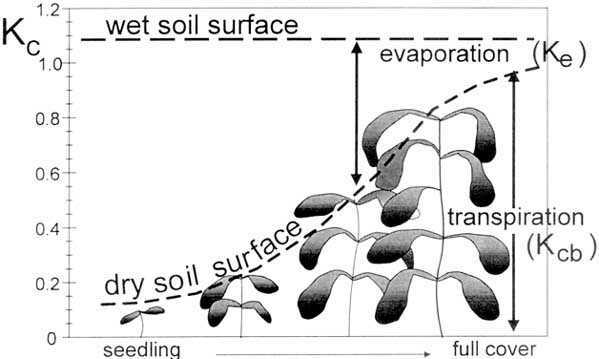 The time for the soil surface to dry is determined by the time interval between wetting events, the evaporation power of the atmosphere (ETo) and the importance of the wetting event. General estimates for Kc ini as a function of the frequency of wetting and ETo are given in Table 9. The data assume a medium textured soil. The procedure for estimating Kc ini is presented in Chapter 6. (*) Note that irrigation intervals may be too large to sustain full transpiration for some young annual crops. The crop development stage runs from 10% ground cover to effective full cover. Effective full cover for many crops occurs at the initiation of flowering. For row crops where rows commonly interlock leaves such as beans, sugar beets, potatoes and corn, effective cover can be defined as the time when some leaves of plants in adjacent rows begin to intermingle so that soil shading becomes nearly complete, or when plants reach nearly full size if no intermingling occurs. For some crops, especially those taller than 0.5 m, the average fraction of the ground surface covered by vegetation (fc) at the start of effective full cover is about 0.7-0.8. Fractions of sunlit and shaded soil and leaves do not change significantly with further growth of the crop beyond fc » 0.7 to 0.8. It is understood that the crop or plant can continue to grow in both height and leaf area after the time of effective full cover. Because it is difficult to visually determine when densely sown vegetation such as winter and spring cereals and some grasses reach effective full cover, the more easily detectable stage of heading (flowering) is generally used for these types of crops. For dense grasses, effective full cover may occur at about 0.10-0.15 m height. For thin stands of grass (dry rangeland), grass height may approach 0.3-0.5 m before effective full cover is reached. Densely planted forages such as alfalfa and clover reach effective full cover at about 0.3-0.4 m.
Another way to estimate the occurrence of effective full cover is when the leaf area index (LAI) reaches three. LAI is defined as the average total area of leaves (one side) per unit area of ground surface. As the crop develops and shades more and more of the ground, evaporation becomes more restricted and transpiration gradually becomes the major process. During the crop development stage, the Kc value corresponds to amounts of ground cover and plant development. Typically, if the soil surface is dry, Kc = 0.5 corresponds to about 25-40% of the ground surface covered by vegetation due to the effects of shading and due to microscale transport of sensible heat from the soil into the vegetation. A Kc = 0.7 often corresponds to about 40-60% ground cover. These values will vary, depending on the crop, frequency of wetting and whether the crop uses more water than the reference crop at full ground cover (e.g., depending on its canopy architecture and crop height relative to clipped grass). The mid-season stage runs from effective full cover to the start of maturity. The start of maturity is often indicated by the beginning of the ageing, yellowing or senescence of leaves, leaf drop, or the browning of fruit to the degree that the crop evapotranspiration is reduced relative to the reference ETo. The mid-season stage is the longest stage for perennials and for many annuals, but it may be relatively short for vegetable crops that are harvested fresh for their green vegetation. At the mid-season stage the Kc reaches its maximum value. The value for Kc (Kc mid) is relatively constant for most growing and cultural conditions. Deviation of the Kc mid from the reference value '1' is primarily due to differences in crop height and resistance between the grass reference surface and the agricultural crop and weather conditions. The late season stage runs from the start of maturity to harvest or full senescence. The calculation for Kc and ETc is presumed to end when the crop is harvested, dries out naturally, reaches full senescence, or experiences leaf drop. For some perennial vegetation in frost free climates, crops may grow year round so that the date of termination may be taken as the same as the date of 'planting'. The Kc value at the end of the late season stage (Kc end) reflects crop and water management practices. The Kc end value is high if the crop is frequently irrigated until harvested fresh. If the crop is allowed to senesce and to dry out in the field before harvest, the Kc end value will be small. Senescence is usually associated with less efficient stomatal conductance of leaf surfaces due to the effects of ageing, thereby causing a reduction in Kc. 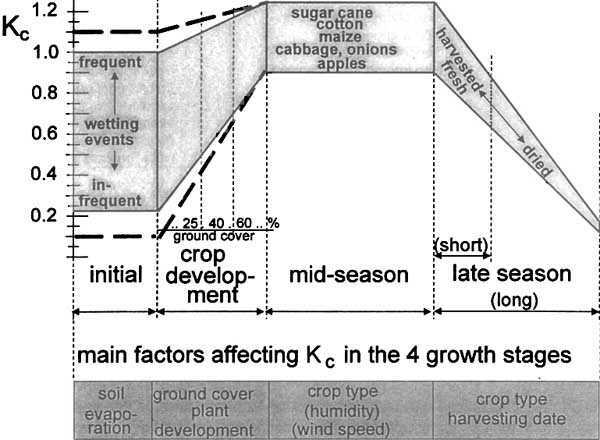 Figure 24 illustrates the variation in Kc for different crops as influenced by weather factors and crop development. Crop evapotranspiration is calculated by multiplying ETo by Kc, a coefficient expressing the difference in evapotranspiration between the cropped and reference grass surface. The difference can be combined into one single coefficient, or it can be split into two factors describing separately the differences in evaporation and transpiration between both surfaces. The selection of the approach depends on the purpose of the calculation, the accuracy required, the climatic data available and the time step with which the calculations are executed. Table 10 presents the general selection criteria. In the single crop coefficient approach, the effect of crop transpiration and soil evaporation are combined into a single Kc coefficient. The coefficient integrates differences in the soil evaporation and crop transpiration rate between the crop and the grass reference surface. As soil evaporation may fluctuate daily as a result of rainfall or irrigation, the single crop coefficient expresses only the time-averaged (multi-day) effects of crop evapotranspiration. As the single Kc coefficient averages soil evaporation and transpiration, the approach is used to compute ETc for weekly or longer time periods, although calculations may proceed on a daily time step. The time-averaged single Kc is used for planning studies and irrigation system design where the averaged effects of soil wetting are acceptable and relevant. This is the case for surface irrigation and set sprinkler systems where the time interval between successive irrigation is of several days, often ten days or more. For typical irrigation management, the time-averaged single Kc is valid. Ke soil water evaporation coefficient. The basal crop coefficient, Kcb, is defined as the ratio of ETc to ETo when the soil surface layer is dry but where the average soil water content of the root zone is adequate to sustain full plant transpiration. The Kcb represents the baseline potential Kc in the absence of the additional effects of soil wetting by irrigation or precipitation. The soil evaporation coefficient, Ke, describes the evaporation component from the soil surface. If the soil is wet following rain or irrigation, Ke may be large. However, the sum of Kcb and Ke can never exceed a maximum value, Kc max, determined by the energy available for evapotranspiration at the soil surface. As the soil surface becomes drier, Ke becomes smaller and falls to zero when no water is left for evaporation. The estimation of Ke requires a daily water balance computation for the calculation of the soil water content remaining in the upper topsoil. The dual coefficient approach requires more numerical calculations than the procedure using the single time-averaged Kc coefficient. The dual procedure is best for real time irrigation scheduling, for soil water balance computations, and for research studies where effects of day-to-day variations in soil surface wetness and the resulting impacts on daily ETc, the soil water profile, and deep percolation fluxes are important. This is the case for high frequency irrigation with microirrigation systems or lateral move systems such as centre pivots and linear move systems. After the selection of the calculation approach, the determination of the lengths for the crop growth stages and the corresponding crop coefficients, a crop coefficient curve can be constructed. The curve represents the changes in the crop coefficient over the length of the growing season. The shape of the curve represents the changes in the vegetation and ground cover during plant development and maturation that affect the ratio of ETc to ETo. From the curve, the Kc factor and hence ETc can be derived for any period within the growing season. The generalized crop coefficient curve is shown in Figure 25. Shortly after the planting of annuals or shortly after the initiation of new leaves for perennials, the value for Kc is small, often less than 0.4. 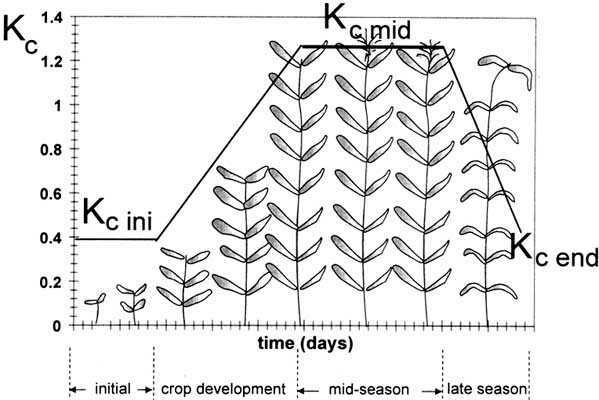 The Kc begins to increase from the initial Kc value, Kc ini, at the beginning of rapid plant development and reaches a maximum value, Kc mid, at the time of maximum or near maximum plant development. During the late season period, as leaves begin to age and senesce due to natural or cultural practices, the Kc begins to decrease until it reaches a lower value at the end of the growing period equal to Kc end. The single 'time-averaged' Kc curve in Figure 25 incorporates averaged wetting effects into the Kc factor. The value for Kc mid is relatively constant for most growing and cultural conditions. However, the values for Kc ini and Kc end can vary considerably on a daily basis, depending on the frequency of wetting by irrigation and rainfall. The dual crop coefficient approach calculates the actual increases in Kc for each day as a function of plant development and the wetness of the soil surface. As the single Kc coefficient includes averaged effects of evaporation from the soil, the basal crop coefficient, Kcb describing only plant transpiration, lies below the Kc value (Figure 26). The largest difference between Kc and Kcb is found in the initial growth stage where evapotranspiration is predominantly in the form of soil evaporation and crop transpiration is still small. Because crop canopies are near or at full ground cover during the mid-season stage, soil evaporation beneath the canopy has less effect on crop evapotranspiration and the value for Kcb in the mid-season stage will be nearly the same as Kc. Depending on the ground cover, the basal crop coefficient during the mid-season may be only 0.05-0.10 lower than the Kc value. Depending on the frequency with which the crop is irrigated during the late season stage, Kcb will be similar to (if infrequently irrigated) or less than the Kc value. Figure 26 presents typical shapes for the Kcb, Ke and single Kc curves. The Kcb curve in the figure represents the minimum Kc for conditions of adequate soil water and dry soil surface. The Ke 'spikes' in the figure represent increased evaporation when precipitation or irrigation has wetted the soil surface and has temporarily increased total ETc. These wet soil evaporation spikes decrease as the soil surface layer dries. The spikes generally reach a maximum value of 1.0-1.2, depending on the climate, the magnitude of the wetting event and the portion of soil surface wetted. Summed together, the values for Kcb and for Ke represent the single crop coefficient, Kc. The total Kc curve, shown as the dashed line in Figure 26, illustrates the effect of averaging Kcb + Ke over time and is displayed as a 'smoothed' curve. It is this smoothed curve that is represented by the single Kc calculation procedure. 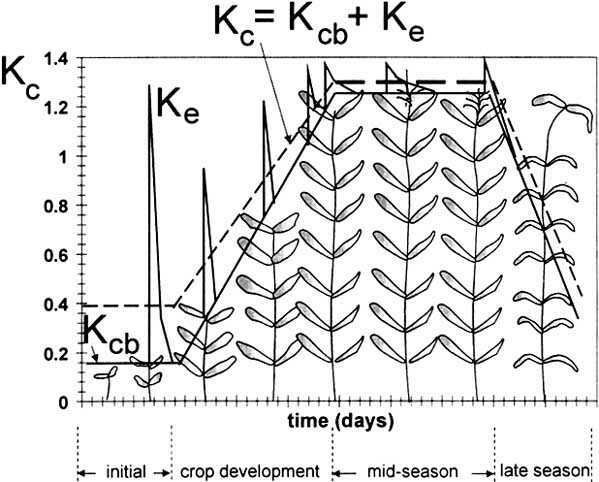 The Kc curve lies above the Kcb curve, with potentially large differences during the initial and development stages, depending on the frequency of soil wetting. The calculation procedures required for the crop coefficient approaches are developed in the following chapters. In Chapter 6, a single time-averaged crop coefficient is used to calculate ETc. The approach using two coefficients to describe the effects of crop and soil separately is outlined in Chapter 7. Figure 27 presents the general calculation procedures.